A-Rod dodged questions about his relationship with Madonna, while estranged wife Cynthia threw her own wicked curveball in court at her allegedly unfaithful hubby! "We're not here to talk about that," said the slugger, when quizzed about his status with Madge. "Times are a bit difficult, but I'll get through them." Difficult may be an understatement. According to bombshell revelations in court papers obtained by "Extra," Cynthia's lawyers have asked the Yankee to cough up any tape recordings from wiretapping or surveillance he may have had on his wife. Did Alex spy on Mrs. 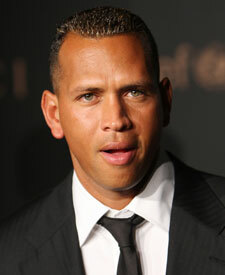 A-Rod?! The Material Girl was notably absent from A-Rod's NYC party last night -- with the exception of some of her hits played by the DJ. Rumor has it that she's planning to make a real appearance at tonight's All-Star game.